ΔBAFF is a novel splicing isoform of the regulator B cell-activating factor (BAFF, BLyS), a TNF family protein with powerful immunoregulatory effects. Overexpression of BAFF leads to excessive B cell accumulation, activation, autoantibodies, and lupus-like disease, whereas an absence of BAFF causes peripheral B cell immunodeficiency. Based on the ability of ΔBAFF to multimerize with full-length BAFF and to limit BAFF proteolytic shedding from the cell surface, we previously proposed a role for ΔBAFF in restraining the effects of BAFF and in regulating B lymphocyte homeostasis. To test these ideas we generated mice transgenic for ΔBAFF under the control of human CD68 regulatory elements, which target expression to myeloid and dendritic cells. We also generated in parallel BAFF transgenic mice using the same expression elements. Analysis of the transgenic mice revealed that ΔBAFF and BAFF had opposing effects on B cell survival and marginal zone B cell numbers. ΔBAFF transgenic mice had reduced B cell numbers and T cell-dependent Ab responses, but normal preimmune serum Ig levels. 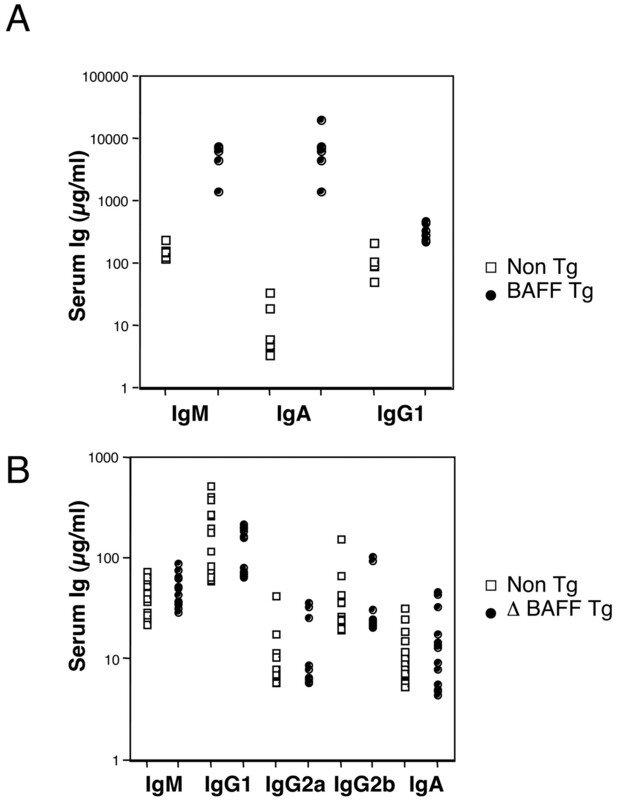 In contrast, BAFF transgenic mice had extraordinarily elevated Ig levels and increases in subsets of B cells. 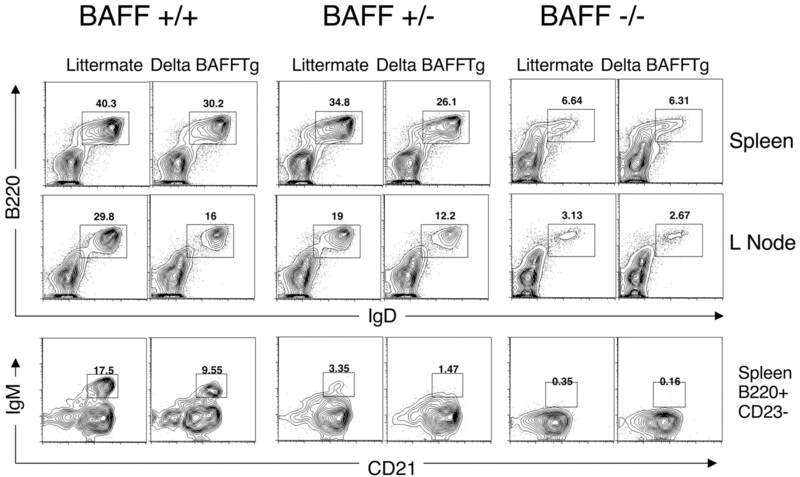 Unexpectedly, both BAFF and ΔBAFF appeared to modulate the numbers of B-1 phenotype B cells. The TNF family-related cytokine B cell-activating factor (BAFF),3 also known as BLyS, TALL-1, THANK, ZTNF4, and TNF13B, has a nonredundant function in B cell survival. Mice genetically or pharmacologically deficient in BAFF or the key BAFF receptor, BAFF-R3, have similar phenotypes, characterized by hypogammaglobulinemia and a severe loss of follicular B cells, the major B cell type (1, 2, 3, 4). BAFF is continually required for most B cells starting at an early stage of peripheral B cell development (5, 6). In contrast, overexpression of BAFF by transgenesis or direct injection of recombinant BAFF promotes a lupus-like dysregulation involving hypergammaglobulinemia, splenomegaly, and autoantibody production (2, 7, 8, 9, 10, 11). It has been suggested that BCR signaling synergizes with BAFF in promoting Ab secretion, B cell developmental progression, and B cell anergy (12, 13, 14). BAFF expression levels are correlated with rheumatic diseases such as lupus and Sjogren’s syndrome (15, 16, 17). These findings suggest that BAFF activity is important in regulating immunity and tolerance. We have recently identified a natural pathway for the negative regulation of BAFF, which involves the coexpression of a receptor nonbinding splice isoform ΔBAFF, the protein product of which can comultimerize with full-length BAFF poisoning function (18). In addition, ΔBAFF, unlike BAFF, is not efficiently cleaved from cell membranes, and so may regulate the biodistribution of BAFF (18). Furthermore, ΔBAFF can form homotrimers, at least when overexpressed in cell lines (18), leaving open the possibility that ΔBAFF3 may exist naturally and play additional roles. Finally, BAFF has been shown to form heterotrimers with the related cytokine APRIL (a proliferation-inducing ligand) in human cells (19), and an APRIL isoform analogous to ΔBAFF has been described (20), raising the possibility that additional mixed heteromers may form with unknown functions. BAFF is known to be expressed by cells of the myeloid lineage, including macrophages and dendritic cells (8, 21, 22). In mice, a major source of BAFF is generated by radioresistant cells of unknown phenotype, as demonstrated by the substantial reconstitution of B cell survival in bone marrow radiation chimeras consisting of BAFF-deficient hemopoietic cells and BAFF-sufficient hosts (23). These BAFF-producing cells may also be myeloid in origin, or may represent some other cell type. We have found ΔBAFF expressed in all cellular sources in which BAFF itself is expressed, including normal macrophages and myeloid cell lines of mouse and human (18), and in human peripheral blood (our unpublished results). In the present study, we probed the possible functions of ΔBAFF by overexpression in transgenic mice. As controls, we also generated a series of BAFF transgenic mice. The cDNAs encoding either a Flag-tagged mouse ΔBAFF, or c-myc-tagged mouse BAFF were inserted into the blunt end repaired XbaI sites in the human CD68 promoter vector (24). The constructs were purified away from vector sequences using KpnI and BsaAI and were microinjected into CBA/C57BL/6 × C3H/C57BL/6 fertilized eggs before transfer into pseudopregnant foster mothers. Thirteen founders for ΔBAFF, and thirteen founders for BAFF transgenic lines were identified. Seven of seven male founders of the BAFF transgenic lines overexpressed BAFF as assessed by increased IgA serum levels. 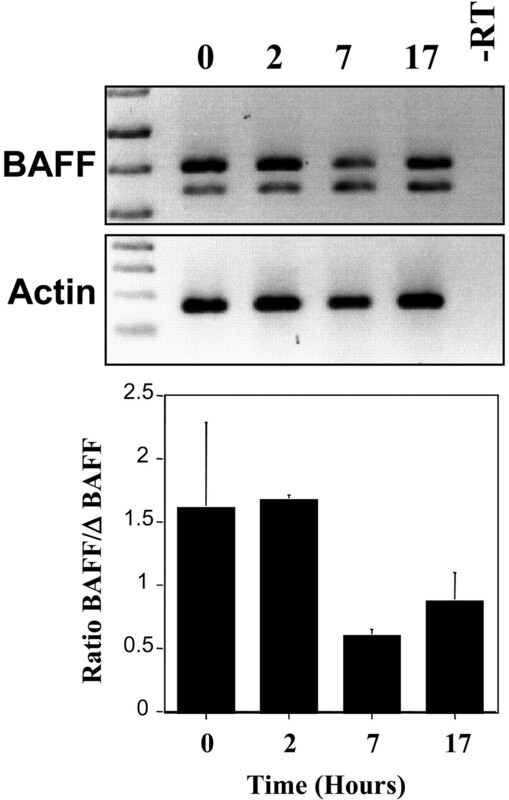 Four of seven male founders of the ΔBAFF transgenic lines overexpressed ΔBAFF protein in bone marrow macrophage lysates in Western blot analysis. Three lines of ΔBAFF overexpressing mice (DBF20, DBF33, and DBF40), and three lines of BAFF overexpressing mice (MB3, MB21, and MB29) were characterized in detail. All lines were backcrossed on the C57BL/6 background at least three generations. In some cases, BAFF-deficient mice (2) were bred to the ΔBAFF transgenic line DBF20 for analysis. These studies have been reviewed and approved by The Scripps Research Institute Institutional Animal Care and Use Committee. Bone marrow-derived macrophages were cultured using L cell-conditioned medium essentially as described (25) although IMDM was used instead of RPMI 1640. In some instances, LPS (1 μg/ml) was added to the cultures for varying time points before harvest. Whole cell lysates from bone marrow-derived macrophages were generated using 1% Nonidet P-40 lysis buffer containing 10 mM Tris, 150 mM NaCl, 0.1 mM EDTA, and 1 mM PMSF. Lysates were subjected to SDS-PAGE under reducing conditions, followed by Western blotting and detection using a polyclonal rabbit anti-BAFF Ab. Six- to 10-wk–old animals were immunized with either 20 μg of trinitrophenyl (TNP)-Ficoll (83/1; Biosearch Technologies) or with 100 μg of TNP-hemocyanin (15/1) in alum at day 0, then again at day 21 without alum. Standard ELISAs were performed on serum from naive or immunized animals. Diluted sera from immunized animals were incubated on TNP-BSA-coated ELISA plates (15 μg/ml), and bound Ab was detected using isotype-specific Abs: IgG1 (A85-1), IgM (R6-60.2), IgG3 (R-40-82). Resting Ig levels were detected from titrations of sera using pairs of isotype-specific Abs. The first listed Ab clone was coated on the plate and the second Ab was biotinylated for: IgM, 11/41 and R6-60.2; IgG1, A85-3 and A85-1; IgG2a, R11-89 and R19-15; IgG2b, R9-91 and R12-3; and IgA, C10-3 and C10-1. Bound biotinylated Abs were detected using streptavidin-HRP (BD Biosciences). Ig levels were quantified either with purified isotype standards (resting serum levels) or by log10 of the dilution of sera in which half the maximal signal was observed. All Abs were obtained from BD Biosciences. Lymphocytes from spleen, pooled lymph nodes, bone marrow, and peritoneal cavity from 6- to 12-wk-old mice were washed with PBS containing 0.5% BSA (w/v), 0.01% NaN3, and 10 mM HEPES and analyzed on a FACSCalibur using a variety of Abs obtained from BD Biosciences or eBioscience, namely, B220-FITC, B220-allophycocyanin, IgM-biotin, IgD-FITC, CD21-FITC, CD5-FITC, CD23-PE, CD11b-PerCP Cy5.5, CD11c-allophycocyanin, and F4/80 allophycocyanin, CD43-PE, CD1d-PE, and CD9-biotin in the presence of Fc block. Biotinylated Abs were detected using streptavidin-PerCP Cy5.5 (BD Biosciences). Anti-IgM (clone M41) (26) was purified from hybridoma supernatant and coupled to Cy5 according to the manufacturer’s instructions (Amersham Biosciences). AA4.1-allophycocyanin was purchased from eBioscience. B cell subsets were defined as mature (B220+IgD+), immature (B220intIgM+), B1 subsets (B220intIgM+CD43+CD5+/−), transitional 1 (B220+AA4.1+IgM+CD23−), transitional 2/3 (B220+AA4.1+IgM+CD23+), marginal zone (MZ) (B220+CD23−IgM+CD21+) or in some cases (B220+IgM+CD1d+CD9+). Statistics were calculated using the standard Student t test function in Microsoft Excel, assuming equal variance between samples. In the case of analyzing transitional B cell numbers, the paired sample t test was applied. The detection of transgene expression was performed by extracellular staining as previously described, followed by fixation with 4% paraformaldehyde and permeabilization of cells using 0.1% saponin. Transgenic expression was then determined by intracellular staining using biotinylated FLAG (M2) detecting ΔBAFF and biotinylated Myc (9E10) detecting BAFF, followed by streptavidin-PE or streptavidin-allophycocyanin. Total RNA was harvested from bone marrow-derived macrophages from wild-type C57BL/6J mice and cDNA was generated from 5 μg of total RNA using oligo(dT) and SuperScript First Strand Synthesis System for RT-PCR (Invitrogen Life Technologies) according to manufacturer’s instructions. cDNA reaction (1–2 μl) was used as template for the amplification of BAFF using PLATINUM Pfx DNA polymerase enzyme (Invitrogen Life Technologies) according to manufacturer’s instructions. Both mouse BAFF isoforms are amplified from cDNA using primers 5′-TCGACCCCACAACTCCAGCCGCGGC and 5′-CAGCTCGTCCCCAAAGACGTGTAC. Actin was amplified from the cDNA using the following primers 5′-GCATTGCTGACAGGATGCAG and 5′-CCTGCTTGCTGATCCACATC. Amplification products were analyzed by 4% agarose electrophoresis. Negative images of ethidium bromide-stained gels were scanned and analyzed by densitometry. To overexpress BAFF or ΔBAFF in vivo in myeloid cells, we generated transgenic mice carrying the DNA constructs shown in Fig. 1⇓A. Epitope-tagged cDNAs of BAFF and ΔBAFF were placed in an expression vector with promoter, polyadenylation signal, and splicing signal. We chose to use the human CD68 promoter (24, 27) because its tissue distribution of expression is believed to be similar to that of BAFF (although knowledge of the expression pattern of BAFF is still evolving). The human CD68 promoter has been successfully used in the generation of transgenic mice (24). We generated BAFF transgenic mice carrying a human c-myc epitope tag and ΔBAFF transgenic mice carrying a FLAG (28) epitope tag in the N-terminal cytoplasmic tail. To assess transgene expression biochemically, bone marrow macrophages from different transgenic lines were expanded in M-CSF supplemented medium, and BAFF protein expression was determined by Western blotting (Fig. 1⇓B). The results indicate that transgene-derived BAFF and ΔBAFF were produced by the cells, but the levels of expression varied widely between founders. Endogenous BAFF protein expression was not detectable in nontransgenic cell preparations by immunoblotting (Fig. 1⇓B, Non Tg). However, BAFF and ΔBAFF mRNA is detectable by PCR in the nontransgenic cells and in other sources of both mouse and human myeloid cells (18). We conclude that the BAFF and ΔBAFF transgenic constructs drive (over)expression of BAFF proteins in vivo, at least in myeloid cells. Transgene constructs for BAFF and ΔBAFF and protein expression in primary bone marrow macrophages. A, DNA constructs showing human CD68 promoter/83-bp first intron (IVS-1) cassette (24 ), modified BAFF cDNAs, including indicated N-terminal epitope tags, bovine growth hormone polyadenylation signal (bGH pA), and selected restriction enzyme sites. Transcriptional start site is indicated with arrow. B, Immunoblot analysis of BAFF expression. Bone marrow macrophages, obtained by in vitro expansion in M-CSF, were detergent solubilized, and protein extracts were electrophoresed through SDS-PAGE, transferred to nylon membranes, and visualized by immunoblotting using a polyclonal anti-BAFF serum. The additional band seen in ΔBAFF transgenic extracts is probably due to an additional, splice generated N-glycosylation site that is used in the mature ΔBAFF protein (18 ). The arrow denotes the BAFF-specific band(s). ΔBAFF and BAFF transgene expression levels were assessed by flow cytometry, taking advantage of their epitope tags to quantitate intracellular protein. All transgenic lines expressed well in the splenic F4/80+ compartment, which is enriched in macrophages (Fig. 2⇓, first row). A subset of CD11c+/CD11b+ dendritic cells also appeared to express (Fig. 2⇓, second and third rows), whereas B cells had negligible expression levels (Fig. 2⇓, fourth row). No expression was detected on T lineage cells (data not shown). We conclude that transgenic mice express in most macrophages and in a subset of dendritic cells. Flow cytometry analysis of BAFF and ΔBAFF transgene expression by intracellular detection of epitope tags. Cells of the indicated transgenic lines labeled (top) were subjected to cell surface Ab stains, then fixed, permeabilized, and stained with anti-FLAG or anti-human Myc Abs to detect ΔBAFF or BAFF transgene products. Gating strategy (left column) shown, with staining levels (right) of gated transgenic mouse cells (bold histograms) compared with nontransgenic controls (dotted histograms). To assess the biological activity of BAFF and ΔBAFF transgene expression, serum Ig levels of transgenic mice were measured. Data shown in Fig. 3⇓ represent pooled data from two BAFF transgenic lines (Fig. 3⇓A) and three ΔBAFF transgenic lines (Fig. 3⇓B). Compared with littermate controls, BAFF transgenic mice had over 10-fold elevated IgM levels and IgA levels that were ∼1000-fold increased (Fig. 3⇓A). In contrast, ΔBAFF transgenic mice had no significant changes in basal serum Ig levels (Fig. 3⇓B). Thus, serum Ig levels of mice not intentionally immunized were elevated in BAFF transgenic mice, but not in ΔBAFF transgenic mice. Serum Ig levels of transgenic mice were measured. Serum Ig levels shown are in mice transgenic for BAFF (A) or ΔBAFF (B). Values from individual (•) young adult transgenic mice (6- to 10-wk-old) and nontransgenic (□) littermate controls are represented. Data are pooled from three ΔBAFF and two BAFF transgenic lines. To evaluate the effects of ΔBAFF and BAFF transgenes on peripheral B cells, lymphoid tissues were analyzed by flow cytometry. These experiments focused on the same two independent ΔBAFF transgenic lines and two independent BAFF transgenic lines shown to have clear intracellular expression. As shown in Figs. 4⇓A and 5⇓, ΔBAFF transgenic mice had significant decreases in mature B cell numbers in spleen, lymph nodes, and bone marrow, whereas in BAFF transgenic mice these populations were expanded (Figs. 4⇓B and 5⇓). Striking changes were found in number and percentages of splenic and lymph node B cells, which were elevated in BAFF transgenic mice and reduced in ΔBAFF transgenic mice (Fig. 5⇓). Levels of recirculating B cells in bone marrow mirrored those in the periphery. These results confirmed the bioactivity of BAFF transgenes on B cell numbers, and revealed a reciprocal, B cell reducing biological effect of ΔBAFF that was consistent with the prediction that ΔBAFF activity directly opposes that of BAFF. Flow cytometry analysis of B cell subsets in lymphoid tissues of ΔBAFF line DBF20 (A) and BAFF line MB21 (B) transgenic mice. Tissues analyzed are labeled at right including bone marrow cells (B marrow), lymph nodes (L node), and peritoneal cavity cells (Per Cav). Numbers represent the percentage of positive cells in boxed inset. Bone marrow cells and peritoneal cavity cells were gated on lymphocytes using forward and side scatter characteristics. These lines are representative of the other transgenic lines studied. Quantitation of B cell populations in spleen and lymph nodes. Mean and SD of the indicated measurements are shown. MZ represent B220+/CD23−/IgM+/CD21+; T1, B220+/CD23−/AA4.1+/IgMhigh cells; T2/3, B220+/CD23+/AA4.1+/IgM+ cells; B-1, IgM+/CD43+/CD5+/−/B220int. Littermates (□), ΔBAFF transgenic mice (▧), and BAFF transgenic mice (▪) in which data are pooled from three ΔBAFF and two BAFF transgenic lines are shown. As BAFF has been proposed to exert its effect on B cells starting at the transitional stages in the spleen (12, 29, 30), we assessed the effects of BAFF and ΔBAFF transgenes on transitional B cell subsets (Fig. 5⇑). The T1 population is AA4.1+/CD23−/IgMhigh, the T2 population is AA4.1+/CD23+/IgMhigh, and the T3 population is AA4.1+/CD23+/IgMlow. Because the distinction between T2 and T3 populations was neither clear-cut nor consistent between experiments, the observed numbers of cells in the T2 and T3 populations were pooled for analysis. As shown in Fig. 5⇑, BAFF transgenic mice had surprisingly little change in transitional B cell numbers. In contrast, ΔBAFF transgenic mice had little change in the T1 population and a significant reduction in T2/3 cell numbers. These data indicate that the reductions in B cell numbers seen in ΔBAFF transgenic mice occur at the T2 and later developmental stages, the same stages at which BAFF is believed to have a biological effect. More detailed flow cytometric analysis was conducted to assess the effects of BAFF and ΔBAFF on other peripheral B cell subsets. Unexpectedly, BAFF transgenic mice had increased numbers of peritoneal B-1 cells, whereas in ΔBAFF transgenic mice B-1 cell numbers (IgM+CD43+gate) were reduced significantly (Figs. 4⇑ and 5⇑). To further address the role of BAFF on B-1 cells BAFF knockout mice were also analyzed (Fig. 6⇓). B-1 cells as gated with IgM and CD5 (Fig. 6⇓A, upper inset right) were CD43+ and B220int, as expected. BAFF- and heterozygous-deficient mice had subnormal numbers of peritoneal B-1 cells in comparison to wild-type mice (Fig. 6⇓B). We conclude that BAFF may augment B-1 B cell numbers, but is not absolutely required for their survival. BAFF heterozygous deficient (+/−) and homozygous deficient (−/−) mice were compared with wild-type littermates (+/+) for the frequencies of B-1 phenotype cells. 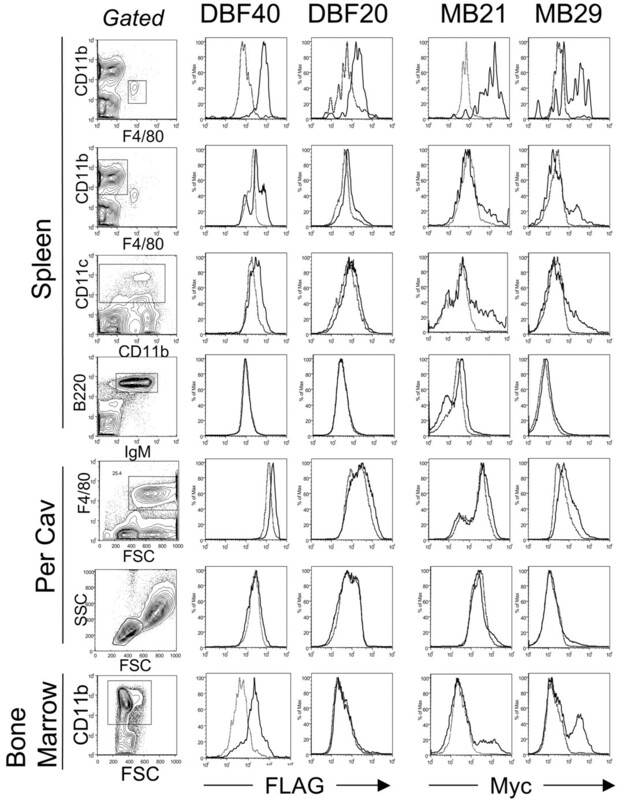 A, Two-color histogram (upper) shows analysis gates defining B-1 population (inset box, right) and B-2 cells (inset box, left), with CD43 (middle) and B220 (lower) levels on these gated populations. B, B-1 cell numbers are shown for individual mutant or wild-type mice. A detailed flow cytometry study of changes in splenic MZ cell number and phenotype was made in the transgenic mice. MZ B cells are CD23low/CD21high/CD1d+/CD9+ cells, however, it has been reported that BAFF levels can modulate the expression of CD23 and CD21 (31). As shown in Fig. 7⇓A, BAFF transgenic B cells indeed had elevated CD23 levels. Conversely, and significantly, splenic B cells of ΔBAFF transgenic mice had lower CD23 levels. 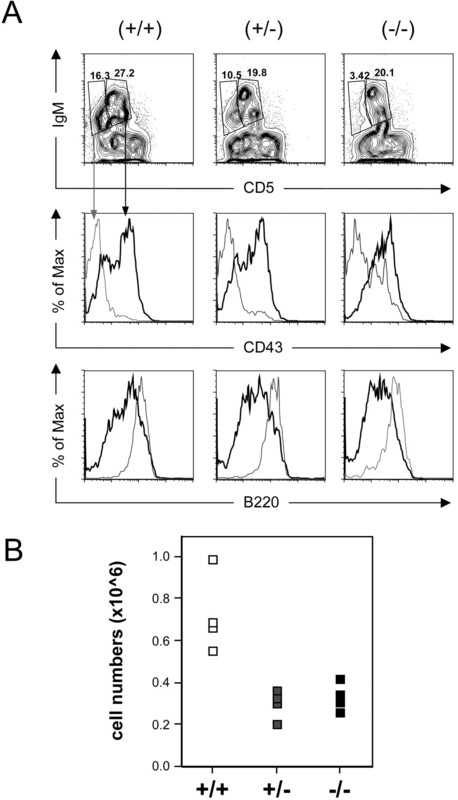 MZ B cell numbers were assessed using conventional markers, including CD23 (Fig. 7⇓B, upper panels) or using an alternative strategy using the markers B220, IgM, CD1d, and CD9 (Fig. 7⇓B, lower panels). These approaches revealed that BAFF transgenic mice had elevated MZ B cell numbers (Fig. 7⇓B, right panels). Conversely, in ΔBAFF transgenic mice fewer MZ B cells were found (Fig. 7⇓B and Fig. 5⇑, bottom) again indicating a growth or survival promoting effect of BAFF and a contrary effect of ΔBAFF. Flow cytometry analysis of MZ B cells in transgenic mice. A, Effect of transgenesis on mean CD23 levels of B220+ cells of transgenic ΔBAFF, BAFF, and littermate mice is shown. B, Alternate strategies for the detection of MZ B cells by flow cytometry reveal reductions in ΔBAFF transgenic spleen and increases in BAFF transgenic. Conventional MZ identification (upper row) shows initial gating on B220+/CD23− cells (left) and individual mice (right) of the indicated genotypes stained with Abs to IgM and CD21. Middle row (left) shows B220+ gating followed by IgM/CD1d staining levels on the gated cells. Similarly, CD9 levels on B220+/CD1d+ gated cells (lower row) are indicated. We next assessed the possible effects of ΔBAFF overexpression on T cell-dependent and T cell-independent Ab responses. 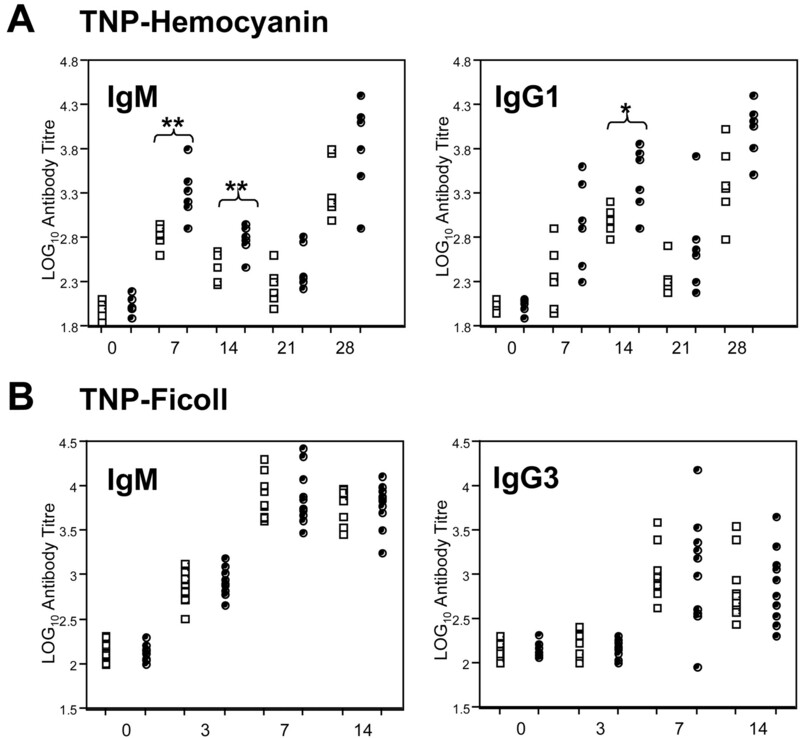 Mice were immunized with TNP-hemocyanin or TNP-Ficoll, and the serum Ab responses quantified (Fig. 8⇓). At all time points tested, ΔBAFF transgenic mice had a subnormal response to the T cell-dependent Ag (Fig. 8⇓, cf open with filled symbols). Subnormal T cell-dependent Ab responses were evident in both the IgM and IgG1 responses. By contrast, responses to the type 2 T cell-independent Ag TNP-Ficoll were not changed significantly in ΔBAFF transgenic mice. We conclude that under the conditions of immunization ΔBAFF reduced T cell-dependent, but not T cell-independent immune responses. Assessment of alterations in the induced Ab responses of ΔBAFF transgenic mice to Ag. ΔBAFF transgenic mice (□) and littermate controls (▪) are shown. A, Mice were immunized with the T cell-dependent Ag TNP-hemocyanin and Ab titers measured on the indicated days postimmunization. B, Immunization with the type 2 T cell-independent Ag, TNP-Ficoll. Titers were assessed by a solid phase ELISA and are presented on a log10 scale. To test the notion that in nontransgenic myeloid cells the relative amounts of BAFF and ΔBAFF splice isoforms may be regulated, we stimulated bone marrow macrophages from wild-type C57BL/6J mice with LPS and performed RT-PCR analysis. By design, this PCR amplifies both BAFF and ΔBAFF isoforms, yielding products that differ 57 bp in size, corresponding to the missing exon in ΔBAFF. As shown in Fig. 9⇓, quiescent macrophages express both BAFF and ΔBAFF isoforms. Upon LPS stimulation, the levels of ΔBAFF changed little, whereas BAFF was reduced over time, particularly at ∼7 h poststimulation. We previously showed that myeloid cell lines can also alter their BAFF to ΔBAFF ratios upon induction (18). We conclude that changes in the BAFF to ΔBAFF ratio can be induced in primary myeloid cells. 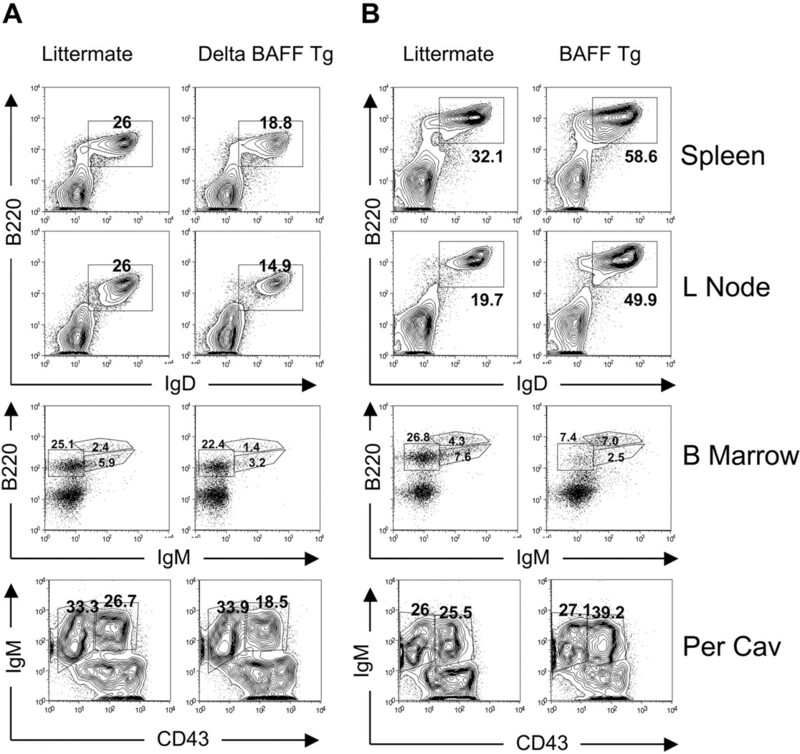 Alterations in BAFF to ΔBAFF mRNA ratios in activated bone marrow macrophages. Isolated C57BL/6 mouse macrophages were stimulated with LPS and RNA was isolated at the postactivation time points indicated (hours). cDNA (upper) was generated and ΔBAFF or BAFF sequences were amplified by a specific PCR using primers that flank the alternative exon sequences lacking in ΔBAFF. Actin cDNA amplification (middle) from same template samples as upper panel. Inverted image (upper) of ethidium bromide stained, 4% agarose gel. The second row of bands (upper) is derived from ΔBAFF transcripts, and the larger are from the full-length BAFF isoform. No products were observed in control reactions in which reverse transcriptase was omitted (−RT). Mean and SD (lower) of several experiments are shown. Finally, to try to determine whether ΔBAFF has a function independent of BAFF, we crossed ΔBAFF transgenic mice to the BAFF−/− background and assessed mice for changes in peripheral B lymphocyte numbers (Fig. 10⇓). Flow cytometry experiments revealed that on BAFF+/+ and BAFF+/− backgrounds the frequency of total IgD+ and MZ B cells in ΔBAFF transgenic mice was consistently lower compared with littermate controls. However, the residual B220+/IgD+ cell numbers of BAFF−/− mice were not further reduced or rescued by the presence of the ΔBAFF transgene. We conclude that the residual B cells in BAFF−/− mice are not affected by ΔBAFF expression. Assessment of B cell numbers in the spleens and lymph nodes of ΔBAFF transgenic or nontransgenic littermates carrying 2, 1, or 0 functional endogenous BAFF alleles. Upper and middle rows show mature B cell populations (B220+IgD+), whereas the lower row shows MZ B cells (IgM+CD21+) initially gated on cells with a B220+CD23− phenotype. In the present study we have tested the notion that the natural splice variant ΔBAFF plays a role in opposing BAFF activity, a role that may be important in B cell homeostasis. BAFF is known to be expressed by cells of the myeloid lineage, including macrophages, monocytes, and dendritic cells (8, 21, 22, 32). We show that ΔBAFF is indeed able to oppose endogenous BAFF function in an in vivo setting. We find that when ΔBAFF is overexpressed under the control of a human CD68 promoter a significant phenotype is obtained in independent transgenic lines, with reduced follicular and MZ B cell numbers. However, the suppressive effects of transgene-expressed ΔBAFF were partial (a 30% reduction in B cell subsets), most likely because the promoter used, human CD68, failed to drive ΔBAFF expression in all cells that produce endogenous BAFF. Because ΔBAFF/BAFF heteromers and homomultimers form extensive disulfide bonds between subunits, it is unlikely that complexes can form in the circulation after synthesis and release. A recent study showing that radioresistant cells make a major contribution to the BAFF levels present in vivo indicates that a major source may include long lived, radioresistant myeloid cells or nonhemopoietic cell types (23). It is unknown whether these radioresistant cells express CD68, or macrosialin. As the human CD68 promoter directs expression to myeloid and dendritic cells (24), our results are consistent with the possibility that CD68-expressing cell types make a contribution to in vivo BAFF activity, and that ΔBAFF expression in the same cells limits BAFF activity. It is unlikely that incomplete suppression of BAFF function by transgenic ΔBAFF was due to insufficient expression in myeloid cells because immunoblotting suggested protein amounts that greatly exceeded those of wild-type BAFF or ΔBAFF. The fact that the phenotypes of our ΔBAFF transgenic mice were fairly uniform, despite wide variations in apparent levels of expression, indicates that the tissue distribution of ΔBAFF expression, rather than its level, was limiting. A surprising finding in our study was that transgenic expression of ΔBAFF preferentially suppressed T cell-dependent Ab response, but had no discernible effect on the T cell-independent response. Prior studies had indicated that BAFF overexpression could augment both responses (10). Our results are consistent with the possibility that although BAFF can augment T cell-independent responses and promote T cell-independent class switch recombination (10, 22), other cytokines typically play a more dominant role. Also consistent with this notion was the lack of influence of ΔBAFF transgene expression on serum Ig levels in unimmunized mice. The lack of reduction in serum Ig levels in ΔBAFF transgenic mice is not surprising given the phenotype of BAFF-R+/− mice, in which B cell numbers are reduced, but serum Ig is not significantly affected (33). One interpretation of these findings is that during a T cell-dependent immune response, T cells may actually stimulate BAFF expression in APCs, thereby enhancing secretion. Support for this possibility comes from data suggesting that CD40L up-regulates BAFF expression from myeloid cells (22, 34 ). Alternatively, BAFF may act directly on T cells in ways that affect the immune response (35, 36). In humans, BAFF can form heterotrimers with APRIL (19). It is unlikely that ΔBAFF works primarily by suppressing APRIL bioactivity because, if this result were so, the phenotype of our ΔBAFF transgenic mice should tend to mimic the phenotype in APRIL-deficient mice. However, this effect is not the case. APRIL-deficient mice have elevated T cell-dependent immune responses, defective responses to T cell-independent type 1 Ags, such as hapten-LPS conjugates, and normal responses to T cell-independent type 2 Ags such as Ficoll conjugates (37). Given that BAFF can interact with both BAFF-R and TACI in mice, it is significant that the phenotype of ΔBAFF transgenic mice resembles closely that of mice that have reduced BAFF-R levels, such as BAFF-R+/− mice (33, 36, 38) and mice heterozygous for the spontaneous BAFF-R mutation in A/WySnJ mice (5). These mutants have reduced B cell numbers and normal serum Ig levels. In contrast, B cell responses in ΔBAFF transgenic mice do not resemble those of mice that lack TACI, which have impaired type 2 T cell-independent responses, normal or elevated B cell numbers, and normal T cell-dependent Ab responses (39, 40). These considerations suggest that ΔBAFF principally suppresses BAFF signaling through the BAFF-R, rather than TACI. An additional finding in our study was that ΔBAFF transgenic mice had normal T cell-independent type 2 Ab responses despite their reduced levels of B-1 and MZ B cells. Although type 2 T cell-independent responses are believed to be derived from B-1 or MZ B cells (41, 42, 43, 44), mutations that diminish B-1 or MZ B cell numbers often do not reduce T cell-independent Ab responses (45, 46). This implies that certain induced responses, such as to TNP-Ficoll, may be mainly derived from B-2 type cells. In our experiments, we have generated a new series of BAFF transgenic mice using the human CD68 promoter, a strategy that was designed to overexpress BAFF from cells that are specialized in BAFF expression. Compared with previously studied BAFF transgenic mice, we find both similarities and differences (7, 9, 47). Prior studies used promoters directing expression to liver (7), B cells themselves (47), or ubiquitously (9). Given these differences, the results have been remarkably consistent, including evidence of increased peripheral B cell numbers, expansion of the MZ B cell compartment, hypergammaglobulinemia, particularly elevated levels of IgA, and evidence of systemic autoimmunity. These findings are consistent with a role for BAFF predominantly as a soluble, rather than membrane bound, cytokine. In our study, we find expansion of B-1 cells in BAFF overexpressing mice, whereas in two of four prior studies no such expansion was described. B-1 cells were elevated in mice in which Ig promoter and enhancer elements drove BAFF expression (47) or in the salivary glands of mice expressing BAFF under α1 antitrypsin promoter/apoE enhancer regulatory elements (48). BAFF is known to be nonessential for B-1 cell development and maintenance (2), however, our study shows ∼50% reduction in B-1 cell numbers in BAFF-deficient animals. Gross et al. (1) noted a similar 50% decrease in B-1 cells in an independent line of BAFF−/− mice, though given the variance, the change in that study was not judged to be statistically significant. Thus, it appears that B-1 cells can be modulated by BAFF levels, although not to the same extent as B-2 cells (>90% reduced in BAFF-deficient animals). As CD68 is not highly expressed in B cells, our results suggest the possibility that local, high level expression of BAFF in myeloid cells may nevertheless augment B-1 cell survival, expansion, or differentiation. The levels of BAFF expressed, as mRNA, or as protein on cell membranes or released from cells, can vary widely depending on cellular stimulation with mitogens, microbial products, or cytokines (21, 32). However, prior studies did not take into account the differing amounts and functions of BAFF and ΔBAFF isoforms. We find that in addition to overall levels of BAFF, the BAFF to ΔBAFF ratio can also be modulated in myeloid cells by cell stimulus. The relative RNA levels of the two BAFF isoforms are sufficiently similar to one another in that this type of regulation is likely to have major consequence on BAFF activity. As ΔBAFF appears to be resistant to cleavage from cell membranes, it can possibly form multimers with BAFF (or APRIL) that retain activity, but are restricted to act locally by cell contact. The in vivo data presented in this study suggest changing the BAFF to ΔBAFF ratio toward excess ΔBAFF would lead to less bioactive BAFF and consequently less B cell survival. BAFF has been implicated in the exacerbation or cause of systemic autoimmunity and in regulating immune tolerance thresholds (13, 14, 49), but is also required for B cell survival (2, 5), suggesting that the balance between these activities is crucial. 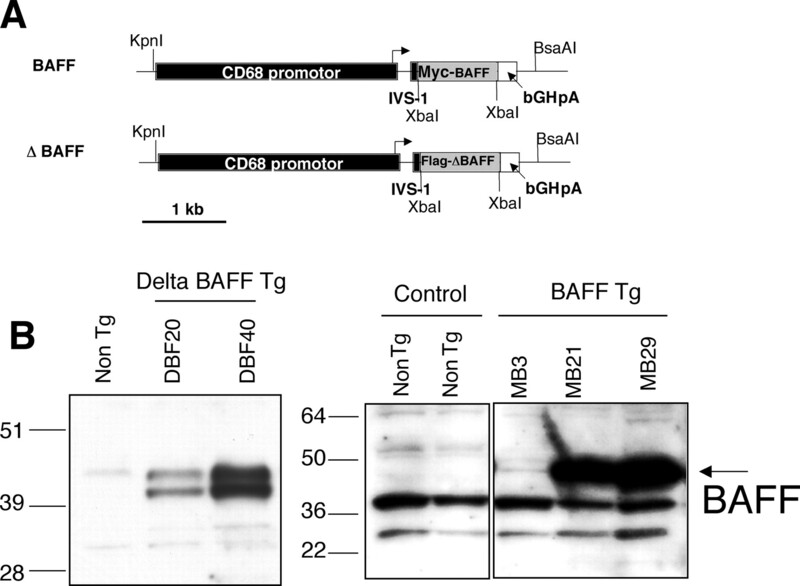 ΔBAFF likely plays a key role in this regulation because it can directly influence BAFF activities through its three modes of action (18): 1) consuming BAFF mRNA by alternative splicing, 2) forming nonfunctional BAFF1/ΔBAFF2 heterotrimers, and 3) preventing release from the plasma membrane of heteromultimerized molecules, possibly including forms with two or more active BAFF subunits. However, it is not excluded that ΔBAFF may have unique, independent functions. In transfection experiments using 293 host cells, ΔBAFF can form cell surface bound homomultimers, but it is unclear whether this isoform alone has an independent in vivo function. To date, we have been unable to find any obvious differences between BAFF−/− mice and BAFF−/− carrying ΔBAFF transgenes. We thank Min Lim for excellent technical assistance and Louise McHeyzer Williams for reading the manuscript. ↵1 This work was supported by Grants RO1GM44809, RO3AR050017 (to A.L.G. ), and PO1AG01743 from the National Institutes of Health (to D.N.). ↵3 Abbreviations used in this paper: BAFF, B cell-activating factor belonging to the TNF family; MZ, marginal zone; TNP, trinitrophenyl. Gross, J. A., S. R. Dillon, S. Mudri, J. Johnston, A. Littau, R. Roque, M. Rixon, O. Schou, K. P. Foley, H. Haugen, et al 2001. TACI-Ig neutralizes molecules critical for B cell development and autoimmune disease: impaired B cell maturation in mice lacking BLyS. Immunity 15: 289-302. Schiemann, B., J. L. Gommerman, K. Vora, T. G. Cachero, S. Shulga-Morskaya, M. Dobles, E. Frew, M. L. Scott. 2001. An essential role for BAFF in the normal development of B cells through a BCMA-independent pathway. Science 293: 2111-2114. Thompson, J. S., P. Schneider, S. L. Kalled, L. Wang, E. A. Lefevre, T. G. Cachero, F. Mackay, S. A. Bixler, M. Zafari, Z.-Y. Liu, et al 2000. BAFF binds to the tumor necrosis factor receptor-like molecule B cell maturation antigen and is important for maintaining the peripheral B cell population. J. Exp. Med. 192: 129-136. Yan, M., J. R. Brady, B. Chan, W. P. Lee, B. Hsu, S. Harless, M. Cancro, I. S. Grewal, V. M. Dixit. 2001. Identification of a novel receptor for B lymphocyte stimulator that is mutated in a mouse strain with severe B cell deficiency. Curr. Biol. 11: 1547-1552. Harless, S. M., V. M. Lentz, A. P. Sah, B. L. Hsu, K. Clise-Dwyer, D. M. Hilbert, C. E. Hayes, M. P. Cancro. 2001. Competition for BLyS-mediated signaling through Bcmd/BR3 regulates peripheral B lymphocyte numbers. Curr. Biol. 11: 1986-1989. Rahman, Z. S., S. P. Rao, S. L. Kalled, T. Manser. 2003. Normal induction but attenuated progression of germinal center responses in BAFF and BAFF-R signaling-deficient mice. J. Exp. Med. 198: 1157-1169. Mackay, F., S. A. Woodcock, P. Lawton, C. Ambrose, M. Baetscher, P. Schneider, J. Tschopp, J. L. Browning. 1999. Mice transgenic for BAFF develop lymphocytic disorders along with autoimmune manifestations. J. Exp. Med. 190: 1697-1710. Moore, P. A., O. Belvedere, A. Orr, K. Pieri, D. W. LaFleur, P. Feng, D. Soppet, M. Charters, R. Gentz, D. Parmelee, et al 1999. BLyS: member of the tumor necrosis factor family and B lymphocyte stimulator. Science 285: 260-263. Khare, S. D., I. Sarosi, X.-Z. Xia, S. McCabe, K. Miner, I. Solovyev, N. Hawkins, M. Kelley, D. Chang, G. Van, et al 2000. Severe B cell hyperplasia and autoimmune disease in TALL-1 transgenic mice. Proc. Natl. Acad. Sci. USA 97: 3370-3375. Do, R. K., E. Hatada, H. Lee, M. R. Tourigny, D. Hilbert, S. Chen-Kiang. 2000. Attenuation of apoptosis underlies B lymphocyte stimulator enhancement of humoral immune response. J. Exp. Med. 192: 953-964. Parry, T. J., T. A. Riccobene, S. J. Strawn, R. Williams, R. Daoud, J. Carrell, S. Sosnovtseva, R. C. Miceli, C. M. Poortman, L. Sekut, et al 2001. Pharmacokinetics and immunological effects of exogenously administered recombinant human B lymphocyte stimulator (BLyS) in mice. J. Pharmacol. Exp. Ther. 296: 396-404. Smith, S. H., M. P. Cancro. 2003. Cutting edge: B cell receptor signals regulate BLyS receptor levels in mature B cells and their immediate progenitors. J. Immunol. 170: 5820-5823. Lesley, R., Y. Xu, S. L. Kalled, D. M. Hess, S. R. Schwab, H.-B. Shu, J. G. Cyster. 2004. Reduced competitiveness of autoantigen-engaged B cells due to increased dependence on BAFF. Immunity 20: 441-453. Thien, M., T. G. Phan, S. Gardam, M. Amesbury, A. Basten, F. Mackay, R. Brink. 2004. Excess BAFF rescues self-reactive B cells from peripheral deletion and allows them to enter forbidden follicular and marginal zone niches. Immunity 20: 785-798. Cheema, G. S., V. Roschke, D. M. Hilbert, W. Stohl. 2001. Elevated serum B lymphocyte stimulator levels in patients with systemic immune-based rheumatic diseases. Arthritis Rheum. 44: 1313-1319. Zhang, J., V. Roschke, K. P. Baker, Z. Wang, G. S. Alarcón, B. J. Fessler, H. Bastian, R. P. Kimberly, T. Zhou. 2001. Cutting edge: a role for B lymphocyte stimulator in systemic lupus erythematosus. J. Immunol. 166: 6-10. Mariette, X., S. Roux, J. Zhang, D. Bengoufa, F. Lavie, T. Zhou, R. Kimberly. 2003. The level of BLyS (BAFF) correlates with the titre of autoantibodies in human Sjogren’s syndrome. Ann. Rheum. Dis. 62: 168-171. Gavin, A. L., D. Aït-Azzouzene, C. F. Ware, D. Nemazee. 2003. ΔBAFF, an alternate splice isoform that regulates receptor binding and biopresentation of the B cell survival cytokine, BAFF. J. Biol. Chem. 278: 38220-38228. Roschke, V., S. Sosnovtseva, C. D. Ward, J. S. Hong, R. Smith, V. Albert, W. Stohl, K. P. Baker, S. Ullrich, B. Nardelli, et al 2002. BLyS and APRIL form biologically active heterotrimers that are expressed in patients with systemic immune-based rheumatic diseases. J. Immunol. 169: 4314-4321. Kelly, K., E. Manos, G. Jensen, L. Nadauld, D. A. Jones. 2000. APRIL/TRDL-1, a tumor necrosis factor-like ligand, stimulates cell death. Cancer Res. 60: 1021-1027. Gorelik, L., K. Gilbride, M. Dobles, S. L. Kalled, D. Zandman, M. L. Scott. 2003. Normal B cell homeostasis requires B cell activation factor production by radiation-resistant cells. J. Exp. Med. 198: 937-945. Gough, P. J., S. Gordon, D. R. Greaves. 2001. The use of human CD68 transcriptional regulatory sequences to direct high-level expression of class A scavenger receptor in macrophages in vitro and in vivo. Immunology 103: 351-361. Vairo, G., J. A. Hamilton. 1985. CSF-1 stimulates Na+K+-ATPase mediated 86Rb+ uptake in mouse bone marrow-derived macrophages. Biochem. Biophys. Res. Commun. 132: 430-437. Leptin, M., M. J. Potash, R. Grutzmann, C. Heusser, M. Shulman, G. Kohler, F. Melchers. 1984. Monoclonal antibodies specific for murine IgM I: characterization of antigenic determinants on the four constant domains of the μ heavy chain. Eur. J. Immunol. 14: 534-542. Hopp, T. P.. 1989. Use of hydrophilicity plotting procedures to identify protein antigenic segments and other interaction sites. Methods Enzymol. 178: 571-585. Batten, M., J. Groom, T. G. Cachero, F. Qian, P. Schneider, J. Tschopp, J. L. Browning, F. Mackay. 2000. 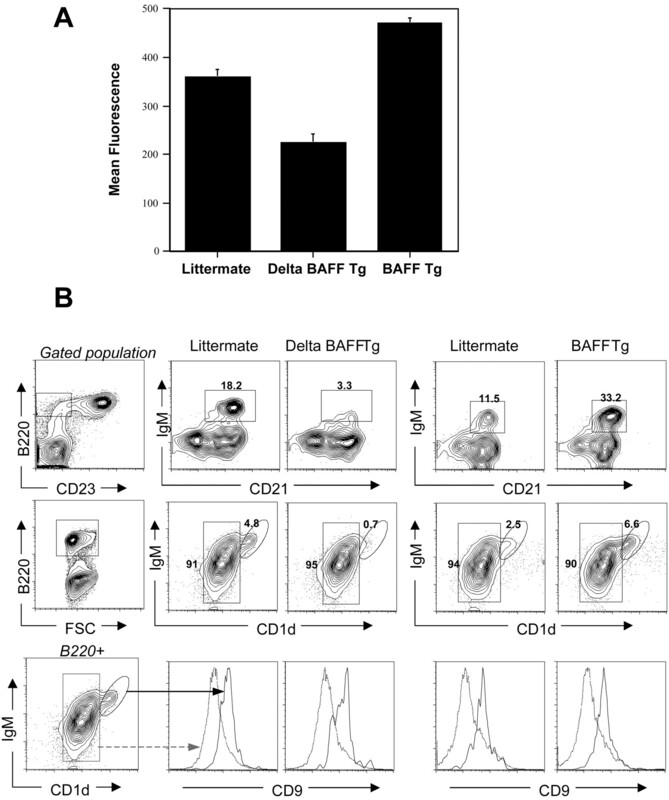 BAFF mediates survival of peripheral immature B lymphocytes. J. Exp. Med. 192: 1453-1466. Rolink, A. G., J. Tschopp, P. Schneider, F. Melchers. 2002. BAFF is a survival and maturation factor for mouse B cells. Eur. J. Immunol. 32: 2004-2010. Gorelik, L., A. H. Cutler, G. Thill, S. D. Miklasz, D. E. Shea, C. Ambrose, S. A. Bixler, L. Su, M. L. Scott, S. L. Kalled. 2004. Cutting edge: BAFF regulates CD21/35 and CD23 expression independent of its B cell survival function. J. Immunol. 172: 762-766. Shu, H. B., W. H. Hu, H. Johnson. 1999. TALL-1 is a novel member of the TNF family that is down-regulated by mitogens. J. Leukocyte Biol. 65: 680-683. Sasaki, Y., S. Casola, J. L. Kutok, K. Rajewsky, M. Schmidt-Supprian. 2004. TNF family member B cell-activating factor (BAFF) receptor-dependent and -independent roles for BAFF in B cell physiology. J. Immunol. 173: 2245-2252. He, B., A. Chadburn, E. Jou, E. J. Schattner, D. M. Knowles, A. Cerutti. 2004. Lymphoma B cells evade apoptosis through the TNF family members BAFF/BLyS and APRIL. J. Immunol. 172: 3268-3279. Ye, Q., L. Wang, A. D. Wells, R. Tao, R. Han, A. Davidson, M. L. Scott, W. W. Hancock. 2004. 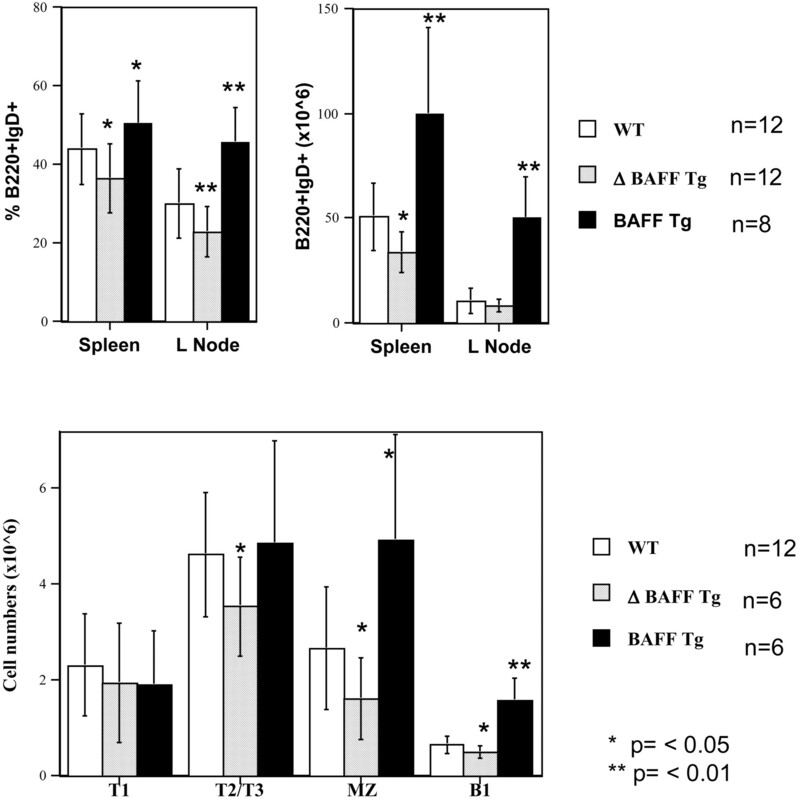 BAFF binding to T cell-expressed BAFF-R costimulates T cell proliferation and alloresponses. Eur. J. Immunol. 34: 2750-2759. Ng, L. G., A. P. Sutherland, R. Newton, F. Qian, T. G. Cachero, M. L. Scott, J. S. Thompson, J. Wheway, T. Chtanova, J. Groom, et al 2004. B cell-activating factor belonging to the TNF family (BAFF)-R is the principal BAFF receptor facilitating BAFF costimulation of circulating T and B cells. J. Immunol. 173: 807-817. Castigli, E., S. Scott, F. Dedeoglu, P. Bryce, H. Jabara, A. K. Bhan, E. Mizoguchi, R. S. Geha. 2004. Impaired IgA class switching in APRIL-deficient mice. Proc. Natl. Acad. Sci. USA 101: 3903-3908. Shulga-Morskaya, S., M. Dobles, M. E. Walsh, L. G. Ng, F. Mackay, S. P. Rao, S. L. Kalled, M. L. Scott. 2004. B cell-activating factor belonging to the TNF family acts through separate receptors to support B cell survival and T cell-independent antibody formation. J. Immunol. 173: 2331-2341. Seshasayee, D., P. Valdez, M. Yan, V. M. Dixit, D. Tumas, I. S. Grewal. 2003. Loss of TACI causes fatal lymphoproliferation and autoimmunity, establishing TACI as an inhibitory BLyS receptor. Immunity 18: 279-288. Yan, M., H. Wang, B. Chan, M. Roose-Girma, S. Erickson, T. Baker, D. Tumas, I. S. Grewal, V. M. Dixit. 2001. Activation and accumulation of B cells in TACI-deficient mice. Nat. Immunol. 2: 638-643. Lane, P. J., D. Gray, S. Oldfield, I. C. MacLennan. 1986. Differences in the recruitment of virgin B cells into antibody responses to thymus-dependent and thymus-independent type-2 antigens. Eur. J. Immunol. 16: 1569-1575. Guinamard, R., M. Okigaki, J. Schlessinger, J. V. Ravetch. 2000. Absence of marginal zone B cells in Pyk-2-deficient mice defines their role in the humoral response. Nat. Immunol. 1: 31-36. Martin, F., A. M. Oliver, J. F. Kearney. 2001. Marginal zone and B1 B cells unite in the early response against T-independent blood-borne particulate antigens. Immunity 14: 617-629. Rickert, R. C., K. Rajewsky, J. Roes. 1995. Impairment of T-cell-dependent B-cell responses and B-1 cell development in CD19-deficient mice. Nature 376: 352-355. Tsitsikov, E. N., J. C. Gutierrez-Ramos, R. S. Geha. 1997. Impaired CD19 expression and signaling, enhanced antibody response to type II T independent antigen and reduction of B-1 cells in CD81-deficient mice. Proc. Natl. Acad. Sci. USA 94: 10844-10849. Gross, J. A., J. Johnston, S. Mudri, R. Enselman, S. R. Dillon, K. Madden, W. Xu, J. Parrish-Novak, D. Foster, C. Lofton-Day, et al 2000. TACI and BCMA are receptors for a TNF homologue implicated in B-cell autoimmune disease. Nature 404: 995-999. Groom, J., S. L. Kalled, A. H. Cutler, C. Olson, S. A. Woodcock, P. Schneider, J. Tschopp, T. G. Cachero, M. Batten, J. Wheway, et al 2002. Association of BAFF/BLyS overexpression and altered B cell differentiation with Sjogren’s syndrome. J. Clin. Invest. 109: 59-68. Zhou, T., J. Zhang, R. Carter, R. Kimberly. 2003. BLyS and B cell autoimmunity. Curr. Dir. Autoimmun. 6: 21-37.